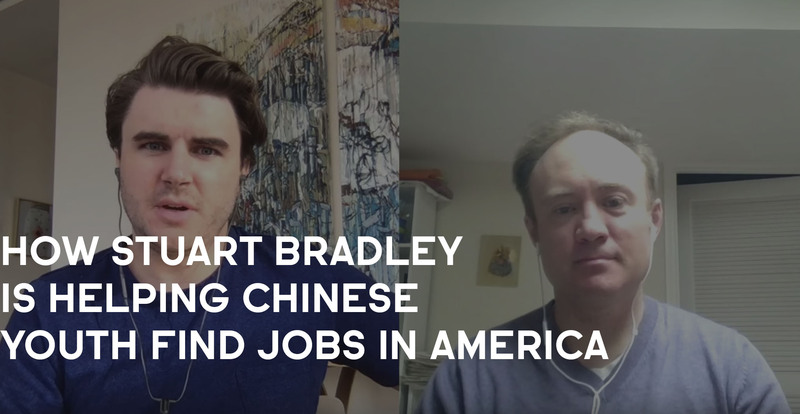 How Stuart Bradley is helping Chinese youth find jobs in America. Want to learn how he does it? 1. How Stuart found his niche helping Chinese youth find jobs in America and why he's passionate about it. 2. How Stuart identified the problems, pains, fears and desires of this niche and was able to step in as a provider of a solution. 3. How Stuart priced his services initially and structured his offer in terms of service delivery and support. 4. How Stuart got his first three clients from doing JV's with insiders who resided in his ideal clients inner world. Pick something that you're truly passionate and curious about because that will make sure you wake up each day and do the work, regardless of challenges and lack of initial results. Doing something you love will keep you going through the good and the bad and that makes all the difference. Sam Ovens:	Hey everyone. It's Sam Ovens here. Today, I've got Stuart Bradley from the Consulting Accelerator program. He's one of our members in the community over there. Stuart's got a really interesting story, which he's gonna share with you today. Stuart, basically, had done 10 years of financial and investment work over in China before coming back to America. He thought, "I should just keep doing the financial stuff", but he joined the Consulting Accelerator program, and it really allowed him to see an opportunity to help Chinese youth get job opportunities in America, and really add value to them, and really solve a big problem. He's been able to do exactly that, and he's been able to build a successful consulting business helping people land their dream jobs, and things like that. How's it going, Stuart? Stuart Bradley:	Doing well. Thank you. Sam Ovens:	Cool. Well, why don't you explain your situation before joining Consulting Accelerator? What did that look like exactly? Stuart Bradley:	Sure. Prior to joining the program, I had been my own consultant, focusing on private equity consulting, mainly. Helping smaller shops without the staffs, to go through and build PowerPoint presentations, board documents, financial models. I would go in there, help institutions do that, smaller institutions, and also high net worth families who had made an investment, but then needed a professional to come in and help them deploy that investment, hirer the expertise around that investment, and make it happen. That was a done-for-you service, it was also pretty general. Private equity, at large, it could be in any industry, and could involve any stage of the process. All along, having been in China for 10, plus years, working at a pretty high level there on a hedge fund. I decided, "Being here doing this consulting is great, but it's just not clicking with all of my skills and abilities." So, about a year ago, prior to joining the program, I had heard about the program, but didn't immediately, at the time, see the fit with my skills, with my background. Then, observing the market, I saw that millions of international children, kids, youth, they wanna come to the United States. Some of them eventually come, but ultimately it's very difficult to succeed here as a professional, for so many reasons. One of them is cultural. Observing that issue, having walked the halls of some of the universities, I saw how many young, very talented people were coming, but then there wasn't ... the universities, or the society wasn't providing that support where, "You've come here, let's really help you get to where you wanna be." It's, "Here's your course guide, here are your classes." Sam Ovens:	What were the cultural issues? Stuart Bradley:	I think a lot of it is, when I went to China, and generally, as Americans, when we go overseas, we're greeted very warmly. Any attempt to learn a foreign language is welcome. When you're coming here, in the other direction, this is the language of international business. People expect, when you come to the United States, to really already be fluent, or willing to interact with people. So much of the career ... I'm a career coach, so much of the career services are kind of waiting on the other side of this bridge where, when international students, when you're ready to come across this bridge, and meet me, and talk to me, I'm here waiting for you. What I do is I go across the bridge, and meet them where they are, in their own language, and work with them one-on-one to bring them across that bridge, to help them take advantage of all the services that are available, but also to teach them modern methods of the job search. Which is, a lot of it, is networking, and really having a focus, and pursuing that focus. I've distilled it into mindset, focus, and method. So, having a successful mindset, a successful focus, and a successful method. Sam Ovens:	Got it. What did you really see ... So, this is before you joined. Right after you joined, tell me how that process went after going through it? Stuart Bradley:	I joined the program in ... I bought the product in December 19th of 2017, and started to go through the modules, and started to think about the offering that I would provide to people, specifically. I had been networking with some career coaches, and had some ideas on content, and then put together ... basically, going through the modules, setting up my website, making the war plan. I had set some goals for myself, such as, in February I wanted to ... this was back in December when I bought the program, I wanted to meet with students at the local university, and understand what their needs are in terms of helping me develop my program. I want to do a hundred strategy sessions, and I want to start developing coaching content for a group setting. On some of those goals, I greatly exceeded my objectives, and in others I didn't. For example, in February, instead of walking into the campus of a local university to ask them their opinion about what services I should offer, I had already done a lot of work, where I walked in there and gave them a lecture, and told them how they needed to go about doing their job search. I had already kind of consolidated and crystallized the mindset, the focus, and the method, those three concepts. February 9th, the day after that conference, I got my first client. This was true to the advertising of the program. Within 40 business days of signing up, I had landed my first client, and that was a Visa or MasterCard situation that followed the script. My observation there was that it's much easier for me, at this point, to work with JV partners to find, in my niche at least, that kind of client, because coming ... JV partners meaning specifically those international youth who have come here through other types of programs where they coach you to come and be successful in U.S. university. Those groups, that population within my niche, is already predisposed to buying consulting programs, and get third party help. When they come to me, they're already really high caliber in terms of their studies, and their ambitions, and they've seen the value of working with a coach or a third party before, so it's really easy to get them on the call, and close it. Once I had closed that first client, that was great, and then I noticed that, as February went on, I hadn't been getting the strategy sessions that I had kind of endeavored. "I wanna do a hundred strategy sessions in February." Then, I realized I had spent a lot of January and February preparing for that speech that I was giving, and preparing my website, and getting really into the technical details of the funnel, and getting all that done, but I hadn't been reaching out to people. Sam Ovens:	Got it. Stuart Bradley:	I hadn't been doing the five or ten emails a day, so that was a big wake-up call for me at the end of February. Sam Ovens:	If we go back to when you first joined the program, what gave you a hunch that this would be a good niche to go into? Stuart Bradley:	That's a good question. The pain that I saw among that niche of, what I consider the niche of the one year, specifically, if I really define it, I'd say the one year international master's program students, coming from overseas. They're going back pretty much empty handed, they're not successful. Sam Ovens:	How did you even get visibility into that niche? Stuart Bradley:	Right. I had previously worked at a university, almost 20 years ago, where I set up their international programs in Shanghai. Knowing the specific people within the university, I was able to go in there, and interview the administrators of these international programs, the master's programs, and say, "What's working? What's not working?" They basically ran me through their customer value chain, or their lifetime of value of the customer kind of a paradigm. I said, "Wow. There's really a pain point here, both for the universities, and also for the students themselves who are mostly going back to China without achieving their goals." Sam Ovens:	How would you define that pain point? Stuart Bradley:	Investing $100,000 dollars to come overseas. Giving up your income that you could have obtained during that time, in addition to try to plant a flag here, get some experience, at least, even if it's just an internship that you could take back to wherever you came from if you decided not to stay, to have a leg up in the employment market. Again, potentially back in China, or somewhere else. There's pain there. At the end of February, I started looking out and seeing that on LinkedIn, all over the place, everyone appropriately stating, "Seeking full-time roles. Looking for internships, et cetera." Sam Ovens:	Is their main objective to always go back and apply the skills learned from abroad back home, or is it either, or? To stay here or to go back? Stuart Bradley:	I'm still figuring this out. I think the goal would be to stay here, if possible. Sam Ovens:	Okay. What do they really need to achieve to consider their 100K investment of moving over here a success? What would that look like? Stuart Bradley:	The success could be varied. One situation is they have an internship here that is a springboard to graduate school, or to a full-time professional role here. Another version of that would be that you have some sort of work experience here that you can take back to China, or again, wherever you came from, and deploy it there. It could be a number of different scenarios. Sam Ovens:	So, like completing their master's, and then getting an actual job, and getting real life experience? Stuart Bradley:	In the course of doing the master's work, or undergraduate work. I have another client who is an undergrad. Getting an internship in that junior year, or after that senior year, or even during the sophomore year. I'm finding the opportunities to make an effective transformation for clients is actually not just isolated to the master's program level students, it's actually across ... It's aware juniors, or aware sophomores in college who wanna use a coach, and see the value of that, or really want to get a leg up in terms of their professional development. Sam Ovens:	How do they think the coaching is really gonna help them with their objective? Stuart Bradley:	What I'm doing is, I'm offering to work with clients until they land, until they get to their objective. It's an upfront payment, and I work with them, and I amortize that over the time that I work with them. Sam Ovens:	Got it. Stuart Bradley:	That's my strategy, at least, at this point. Sam Ovens:	What are the main things you've really gotta help them with to achieve that? Stuart Bradley:	For those who have accepted the value of the coaching, and they're signed on, there's a direct parallel to how you go about closing a client on, be it organic or inorganic methods, through the phone call. The approach of selling somebody on a coaching program, and the concept of selling yourself, as an individual, into the employment market are similar. It's the art of selling yourself. How do you take a total stranger, and convert them either into a friend, an ally, or someone actually giving you a job offer? It's the process of doing direct outreach, say through LinkedIn, with a specific job target, or job focus. It's defining that focus, first of all. How do you identify what you wanna do, what you wanna offer to the market? It's the Venn diagram stuff that you talk through in your course. It's, what does a market want? What are you skilled at doing? What do you wanna do? Is there a sweet spot in there somewhere? If you can identify that, then you have the opportunity to state your value proposition, which is, "I help A to do B through C." If you can do that, get people on a call, say through email, get them on a call, and then get to meet them one-on-one, and make your value proposition known, and demonstrate your interest in X, Y, Z role, and follow modern methods of the job search, which is ... You don't talk to somebody and say, "What do you have at your shop that you could hire me for? What's available at your shop?" That puts people on edge, and on the defensive. Networking is about sitting in front of people, and helping them ... make it easy for them to help you, as the job seeker. You follow a script within that process. You follow your own script, that I recommend, to get more contacts, to make it easy for people to help you in your job search. At every stage, there's a gating factor, just like there is a conversion rate between direct and organic outreach, to getting people on the phone, to getting them from a strategy session to a paid client. Each of these are all gates at which there's a pass through rate. Every client that I coach, should become aware of what their own pass through rates are, and start with the end in mind. If you wanna have two job offers, then if you're closing one in every three interviews with an offer, then you need to have six interviews. How do you get the six interviews? Let's step this back, and really examine, with hard numbers, how many cold emails you need to send out to make that happen. Your pass through rates are gonna be much better if you are connecting with, say, alumni from your current organization. A lot of people, when they come in, it doesn't matter where you come from, overseas, even the United States, it's really the same. When you come into college, you don't really have a concept of that. You just don't ... For those who really want to ... Honestly, when I was in college, I wasn't one of those types, I was working at summer camps. For those that want to start getting those high caliber internships, and are really focused on career, there's a way to do it that's successful. It's not waiting around for people to find you. Sam Ovens:	Got it. So, a lot of people probably come over with good intentions, and stuff, but then they get a bit lost, and just kind of float around through the system, and then kind of go back? Stuart Bradley:	Yeah. Exactly, Sam. I had sat in on one of these orientations for international students a couple years ago, and that's what they were basically telling the students. They were saying, "You're gonna come here, and this is gonna be your level of happiness. It's gonna start up here, you're excited, and then it's gonna go down. It's gonna hit bottom, and then it's gonna come back up." I'm thinking, "You're telling them that's the way it's gonna be, and it has to be, and just to expect it? Why does it have to be that way? Why couldn't someone come in with a lot of excitement, have a really good support system in place, and make that dip shallower, and come out on top?" I didn't see- Sam Ovens:	Invert the whole thing? Stuart Bradley:	It would invert the whole thing. Yeah, exactly. I didn't see it as a foregone conclusion. Why were these universities hiring people to come in and tell them how hellish their experience was gonna be. That was really where I saw there was an opportunity to, like you said, invert the situation. Sam Ovens:	Got it. Now it's clear how you actually came up with this niche, and knew that there was a problem there, and everything. When you first explained it, I was like, how did you know that niche ... because that just doesn't happen. Usually people have some lead in or some hunch as to why there's a problem there, which you had from previous work experience. There was obviously a bit of passion there, too, because working with China and all of that. You joined Accelerator, you picked this niche, you were confident there was a need there, and then you told me that you got your first client. How exactly did that process go there? Stuart Bradley:	Sure. This relationship came through a JV relationship. There is a value chain out there where, for international youth coming to the United States, where you can be coached on the front end. Stepping back one step further, there's a whole industry that began decades ago with grades, where the goal was that you needed to get good grades. The market provided all these services to get good grades. People realized that grades weren't really the whole thing. A kid would come to the United States, or to any institution, and have a really terrible experience, even though they had good grades. New products in the market have emerged in China to coach youth, beginning in high school through to getting offers into the top U.S. universities, and developing some sort of method for developing trust between the applicant and the university through this kind of stamp of approval. I have a classmate who does that professionally in China, and told him that I was gonna be working in this business. He was coming through St. Louis from Beijing, and we had breakfast. I said, "I'm doing this business and it is our chance to work together." He said, "That sounds fantastic. I can start to put you in touch with some people, and we can go from there." I said, "Are you doing this business already, this referral business?" He said, "Yeah, I'm doing this. There are other providers out there." I said, "What are they paying you?" "They're paying me 25%." I said, "Okay, well, let's just say I'll pay you 33%, let's just do this." I wanted to make it something that he couldn't refuse, and sure enough, he did. He provided me with a couple of folks, and my first client was closed through that arrangement. It's actually quite nice, because this particular client ... it's easier for me if they've already gone through a couple of years of undergraduate experience in the United States, because they've had to deal with a lot of the challenges of living in this culture, and communicating in this culture. It's actually a lot easier for a senior in university to work on a professional job search, than it is somebody who has come from literally no U.S. experience whatsoever, over here to the United States, and then to look for a job. For me, this has been a learning experience, in itself, understanding what's written on paper in terms of a resume, and what's said there, and what the actual performance of the individual is. To your point, the first client came through a breakfast, a couple of WeChat exchanges, and then WeChat introductions to people. So, my friend saying, "Hey, this is Stuart. I'm connecting you over WeChat now. He's a job coach, you might like to chat with him." Sam Ovens:	Got it. So, you found it was easier to sell a cure than a prevention. Stuart Bradley:	Yes. Sam Ovens:	So, they've been here, and they already knew the pain, they wanted out, compared to people who were here, and hadn't experienced the pain yet, because they don't know if it's real or not. You know what I mean? Stuart Bradley:	Yes. That's a really good point, Sam. My hypothesis is that, potentially, the best paying clients ... My hypothesis is that this coached, done for you, one-on-one, until you find it kind of job coaching service, is probably valued at 10 or 20 thousand dollars back in China. I think it's pretty valuable, especially for people who have not yet been here. For them, the prospect of coming to the United States, it's so amorphous, and unknown, that if you knew you had somebody at your back supporting you when you came here on the job search, they would pay for that, because the uncertainties are so high. When you come here, I'm finding that, it's a double edged sword. If you come here, you become a better quality candidate to work with me, you become an easier client to work with. Then, say you've gone through three years of undergrad, but if you come here as a master's student, and you've had literally no U.S. experience whatsoever, you might have been here for a couple months, and feel like you've gotten the ropes, and understand how to survive in the culture, but actually you haven't. It's kind of a false sense of security, because professionally executing a job search is so different than living in your bubble on campus, and going to class. Sam Ovens:	Got it. How did you price your offer when you were ... you knew what the problem was, you knew what you were gonna help them with, how did you determine pricing? Stuart Bradley:	I thought about it in terms of what families are committing for their next generation to be successful. They're committing at the level of hundreds of thousands of dollars to come over and have kind of a further study experience, or undergraduate experience at 200 or 300 thousand dollars. I'm taking that into consideration, and then I'm also looking at what the Chinese market is offering in terms of some basic job services like resume reviews, and things like that. I've come up with my hypothesis that this should be, in the full scale scenario where I've got a lot of testimonies, and people are really happy with the service, but I'm charging around $20,000 dollars per person. That's my theory. What I've come into the market with is around $5,000 dollars, to say, "I'll start, and I'll work with you, and let's just say it takes you 10 months to land, so basically you've prepaid me at the rate of $500 dollars a month, which isn't killer, but it's a place to start." For me, I like to think about this in terms of unearned revenue. I really wanna recognize the sale and the success once they've landed. So, they pay me $5,000 dollars, and I want to work with that person until they've landed. It depends on the person, really Sam. I don't go out and say how much this is. I'm following the script in saying, "This is ..." The pricing comes at the end when they ask for it. If someone's sitting in California with, clearly, a lot of a work to do, and a lot of introspection yet to be done, you're probably looking at a 12 month process for that person to land a job that they really like. I don't think I'd price that at $5,000 dollars. I'd probably price that at ... Still, very advantageous, I might say, "Hey. My price is normally $15,000 dollars, Joe, but for you, I'd like to give you a special deal since we're on this call together, of $7,500 dollars." Sam Ovens:	Got it. Stuart Bradley:	For me, it's still experimental. I'm still trying to work out what is the sweet spot. Sam Ovens:	Got it. How are you delivering the services to them? Is this a group training, do you have a course done for you? How does this really work? Stuart Bradley:	Previously, I'd work with a career coach. This coach followed that model of upfront ... I think he was charging $3,000 dollars. He had a series of seven modules that I thought were kind of nice, beginning with a preparation for job search, all the way through to post career, post landing, networking, and how to maintain your network. This was an offering that's available to executives. I consider it to be best in class. I've adapted that with the permission of that individual, to offer this. On the front end, it's six weeks of training that I unlock for the person as they're prepared, it could be on a weekly basis. I basically like to start with somebody in week one, and by week four, I like to have them interviewing with companies in their target area. That's possible. I've done that with some of my clients, but it's not the case if someone's hung up on becoming an entrepreneur, and they can't figure out if they wanna become an entrepreneur or an employee, that's a soul searching process that can take weeks. It's not as fast. It's a six week module. It's one-on-one, so I'll meet with you, if you're in town, I can meet with you, but typically my clients are not in town. So, I meet with them, and I either do it over WeChat, or ... mainly WeChat, that's the main platform. It could be video, more often than not, it's audio. I'm introducing the module to them over the phone, or over WeChat, and then they're unlocking the module. Then, I'm making myself available to them on a weekly basis, for an hour. That's a fixed time, but then also ad hoc. Right now, I'm not slammed with clients, so I have extra time that I can give to these people. If they have an ad hoc question about, "Hey, how do I respond to this email to this director at [inaudible 00:27:55]?" I can be there with them on WeChat to advise, "Yeah, take away that exclamation point. Say 'thank you' at the end." I can really give them a really high level, tailored service. That's what I'm doing right now. It's the done for you, one-one-one approach. My aspiration is to graduate to a group coaching situation. Sam Ovens:	Got it. How many clients do you have at the moment? Stuart Bradley:	I have three. Sam Ovens:	How did you get your other two clients? Stuart Bradley:	The first client came through the JV relationship. The second came through me going to a university, and giving a lecture, and one out of the 20 in the lecture, becoming my client. The third came through friends and family. Friends approached me about their daughter-in-law, who is a Chinese national, who has used them to become an American citizen. So, a young Chinese lady who is going through this issue of figuring out if she wants to be an entrepreneur, or if she wants to be an employee. For her, the transformational experience would be to have a first job experience in the United States. I had spent some period of time before landing her to work with her on examining that issue. It's three clients right now, and that's been really without any direct marketing, which has been an interesting ... It's like, "Oh, yeah. I wanted to do a hundred strategy sessions in February, but I'm not sending out any offers to people." Sam Ovens:	It seems like you're getting just those initial foundations together. Stuart Bradley:	Yeah. It's just the initial foundation stage. Sam Ovens:	Like, getting their trust, and that this niche has this problem, they see value in what I'm offering, and what I'm offering actually helps them. Connecting all of those dots until it clicks, and then the scale comes. Stuart Bradley:	I've gone through week ... I'm on week five now of the Consulting Accelerator, so I've gone to the point of running a likes campaign, and building up a professional Facebook page. I've not gone through the process of doing paid marketing, yet, because I feel like I haven't even just barely scratched the surface of direct outreach. Sam Ovens:	What- Stuart Bradley:	So, I've ... Sorry. Yeah. Sam Ovens:	For you, going through the Consulting Accelerator, what would you say was the most transformational piece for you, or the most helpful piece of the program? Stuart Bradley:	It's gotta be the mindset. It's gotta be the recognition that waking up every morning when you realize you're awake. Right? What's your state of mind? Having that tool to guide your state of mind is, I think it is everything. It's seeing you, having gone through the process, and seeing your enthusiasm for the mindset training, and then willing to sit down and do it. It's just, that's it. That's probably the most helpful. On top of that, having, in terms of the step by step modules, in terms of, "I'm gonna walk you through how to set up your schedule one system with the active campaign, the plug in, and what not." That's really important. Just going step by step, and following that process, for me, was an area that I had not explored before. So, that was really helpful, too. Sam Ovens:	Got it- Stuart Bradley:	The script, I mean, there's more. The script, right? How could we not mention the script in this thing? The script, and the alchemy conversion script, and that's really amazing, because it's really ... For those of us who work, and have been used to working in corporations, we kind of forget that we're selling ourselves every day. When you put yourself in that position of selling as a consultant, it's a much more, there's more on the line. Your livelihood is on the line, and you want to be awesome at it. Training on that script has been an anchor, as well. Sam Ovens:	Got it. Cool. What would your number one piece of advice be for other members of the Consulting Accelerator? I'm sure you've seen people on the Q and A calls on the Facebook group, you've probably talked to some of them. What's your number one piece of advice for them? Stuart Bradley:	For me, I'm quite passionate about this work. That pulls me through. If I was just in this, looking at the financial situation, it would be more challenge, because I'd have more anxiety around, "Gosh, am I making the money, or not?" For me, I really want people to be amazing in their careers, and I want people to be successful. I think everyone should be able to break free from these old models of thinking. I think, if you can find a pain point somewhere in your experience that you've come across, or are willing to find one in an area that you're passionate about, I think that'll carry you through those more difficult times. Sam Ovens:	I think that's good advice. Cool. Well, thanks a lot for jumping on today, and sharing your story. I'm sure it's gonna help a lot of people who are in those initial stages in trying to figure out what their thing is, and all of that. So, thanks a lot. Stuart Bradley:	Yeah, I'm happy to talk with others about their questions, as well, at that earlier stage. Any time. Sam Ovens:	Cool. Thank you. Stuart Bradley:	You're welcome, Sam.